Description Varsko (from Danish, in English: warn, alarm) is a luminous system composed of 2 autonomous bounds which illuminate intersections between the bike path and the road. A bound is composed of 5 LEDs, and is activated when the light goes down. Then two types of lighting will engage simultaneously. The first type is a LED illuminating the road with a green band, indicating the path the path for the cyclists. The second type is a white light, produced by 4 LEDs, which is propagated around the outer bound of the path. As a cyclist approaches, due to the presence detector, the light will flash for 10 seconds warning motorists of the crossing of a cyclist. Additionally, the system is also equipped with a solar panel that allows it to recharge when the system is turned off during the daylight. 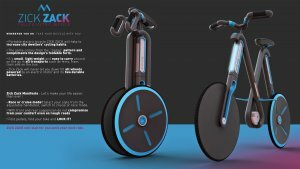 Description Deformable multi-purpose bicycle can bring a differentiated experience to users through a combination of ways. 2、Electric vehicle mode, driven by a unicycle. 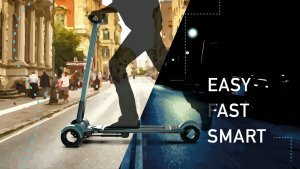 3、Scooter mode, the handlebars are added to the unicycle. 5、Trailer mode, can be used when transporting goods or shopping. 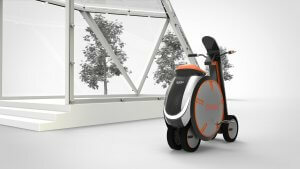 Multi-purpose vehicle, allowing users to experience the convenience through its different capabilities. 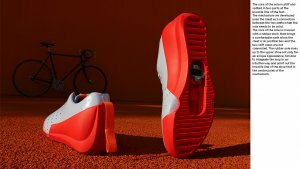 Description WR_2P is a cycling shoe for people who don’t want to sacrifice an ergonomic walk while requiring the best possible power transmission when cycling. The shoe’s cleat has two positions. The first position the she is made for cycling and the cleat is stiff on the bottom of the sole. The second position is made for the cyclist to walk comfortably; this is done through pulling the loop of the cleat back which it becomes hidden inside the sole of the shoe. No matter if you are a commuter, a messenger, or just enjoy riding your bike, the WR_2P provides both convenience and functionality to the user on and off the bike. 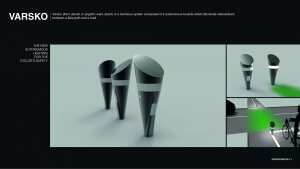 Description The overall design utilizes a simple language, eliminating unnecessary structure, making the body of the bicycle smooth, appealing to the aesthetic of the urban young adult. The design offers a simple folding method, allowing it to be space conscious and can be easily stored. The unilateral design of the front fork ensures that the structure is stable while being portable. 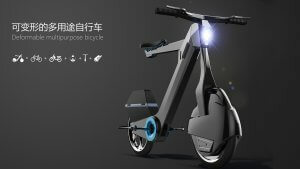 Description Portable electric bicycle, Zick Zack, will make city dwellers increase cycling habits. The design is in the name of the zigzag foldable form. Small size, lightweight, and easy to carry. Whether on the ferry, on the tram, on the trendy, or on the bus, it can be carried easily. 1. Race or cruise mode! Select the style from the adjustable handlebar, switch to Cruise or Race mode. 2. With front and rear suspension, do not compromise on comfort even on rough roads. 3. 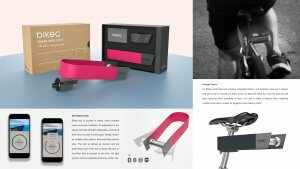 Fold pedals, fold your bike and lock it! 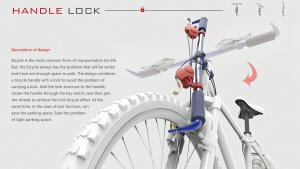 Description The Handle Lock brings together a bicycle handle a a lock to avoid the tediousness of carrying a lock. Simply add the lock structure to the handle, rotate the handle through the key switch, and then jam the wheels to achieve the locked bicycle effect. At the same time, it also saves space, easing the problem of tight parking situations. 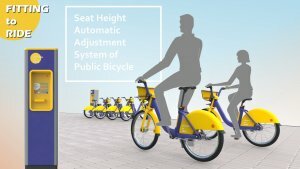 Description Fitting to Ride is a public bicycle system that includes a seat with built-in automatic height adjustment, where the seat’s height can be adjusted to fit users according to their height and or personal preference. 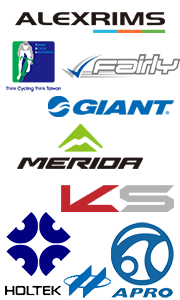 The personalized settings would be saved in the cloud database to provide for a more convenient and comfortable riding experience for each user. Description Riders tend to get injured when rushed and in complex road conditions because they have to divert their concentrations from the road to focus on tuning shock absorbers to match their road conditions. IntulBike System equips your bike with a brain, adapts to your heart to keep you safe during every challenging trip in your life! 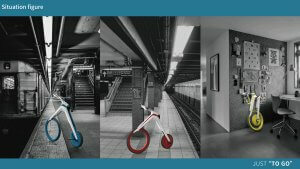 Description Bikeg is designed with a bold appearance that looks strong, which discourages any thieves at first sight. The design offers multiple color options, which demonstrates the owner’s style. The lock is defined as medium and top grade. The majority of the lock is made with titanium alloy. When the lock is placed on the bike, there is a tail light function available, allowing for a safer ride. Additionally, the lock’s design is concise in shape which makes it attractive for mass production. Description According to current trends, non-gasoline personal mobility will become smarter and increasingly compact in the city for short distance traveling. Therefore, there will be a large percentage of the population using non-gasoline locomotion surfing throughout modern cities. That’s why it is important that a new design on non-gasoline locomotion should have compatibility in the features of space saving and crowd sharing. The platform built for sharing mobility can offer more devices, and create more efficient city transportation. Description Bieg Bicycle Transport is an efficient distribution system aimed to deal with the social issue regarding human resources needed by prompt transportation of bicycles. The mission is to redesign a trailer that is suitable for transporting bicycles and improves efficiency. Bicycle-sharing often leads to sight pollution in urban environments in China. Through the use of a precise distribution system, there can be fewer bicycles. Description Childhood often provides the best memories for people, and children with disabilities in their hands are often eager to ride their bikes happily like normal children. This three-wheeled stroller is based on a generalized concept that can be used by normal children as well as children with physical disabilities, which can narrow the gap between the children with and the children without disabilities. The front wheel is used to drive and rear wheel are used to steer which reduces the chance of rollover. The operation is simple and the two-handed style also resembles the fantasy of riding a chariot. Description Togo is designed for the short-ranged commuters and the commuters that utilize public transportation. The closed folding patterns has a slim design which reduces the chances of colliding with other passengers on public transportation. Simply close and fold the bicycle making it compact to transport as the wheels fold in together which saves significant space compared to general folding bikes on the market. 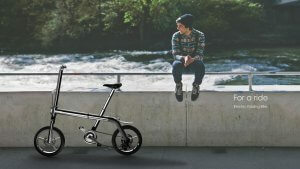 Togo’s thickness is half of the general folding bicycle, the pedal and the grip can also be fully closed. 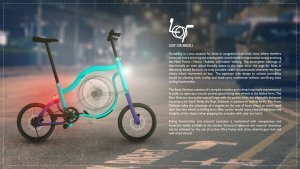 Description Loop for Wheels is the optimum bike design to achieve portability in congested multi-level cities shall be allowing both trolley and hand-carry movement without sacrificing basic cycling functionality. Therefore, the Body Skeleton consists of a warped crossbar, and a drop loop made asymmetrical to open up a pocket space fitting two wheels in folded form. With magnets and dual-purpose hook which stabilize the folded parts and wheels, bike carrier would enjoy physical solidness and integrity of the object when gripping the crossbar with only one hand, no matter for storage and movement indoors or taking through public transport including the Metro, encouraging mixed-mode transport. 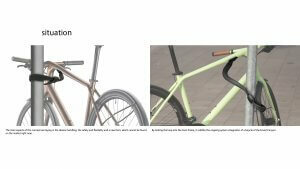 Description The upgradable Chopper bike offers a chance to re-experience cycling. Combining the past and present, it differentiates from others with its prominent ability to be “transformed” into various dimensions, lending riders convenience and flexibility. Configuration 1, an amalgamation of penny farthing and modern edge styles, kicks off the series by catering to beginner riders. Configuration 2, which is equipped with a cozy back rest and suspension to provide the most comfortable posture. Configuration 3 comes as an upgraded version, equipped with an E-motor. 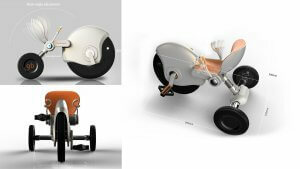 The upgradable Chopper bikes boast aggressive, edgy and distinctive designs which allow bikers to make a personal statement to exhibit their unique personalities. 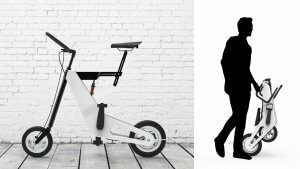 Description The Urban Bicycle is designed for male urban commuters who cycle for short distance (ideally less than 1 mile) daily. The folding process is easy and fast. 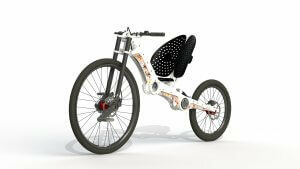 After folding, the bicycle takes minimal space to stand and the rear wheel can be rolled. The chain and the gears are covered by the body to prevent the user getting dirty. Aluminum body and belt chain makes it lightweight. A bigger rear wheel increases the speed efficiency. The handlebar’s angle can be adjusted. The brake paddles can be attached to both side of the handlebar. The handlebar can also be used as a lock system. The handlebar can be attached on the body by the magnets inside after folding. Description WaveDancer Water bicycle is a new type of portable water bike designed for cycling enthusiasts. 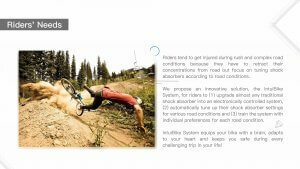 It aims to optimize the cycling process from carrying to using. The bicycle uses two kinds of power sources: human power and electric power, driving the air propeller and generating forward power. 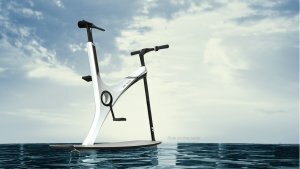 At the same time, the floating surfboard will gain further lift, allowing the bike itself to float on water. Adding gyroscope to the body design to make the water ridding process more stable. To make it more portable, users can disassemble the bicycle and carry it with shoulder. Description There are 7kg light bicycles, which have to be secured with 3kg heavy locks. By locking it into the main frame, the lock becomes less vulnerable to outside impacts and open to more flexibility. The lock gets further integrated into the system of the bike itself, rather than being an outside accessory. To open the lock, a small RFID chip has to be held close to the reader inside the frame. The chip can be integrated into any kind of accessory of the owner and the reader is powered by a hub dynamo. 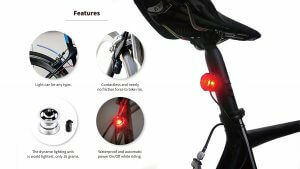 Description Xbat-M is one of the kind aftermarket dynamo lighting system for all kinds of bikes. Xbat-M has a very light weight energy harvesting dynamo and a lighting set. The lighting set is connected to the dynamo with electric cables. Lighting set has super capacitor integrated. Xbat-M is automatically turned on and has very minimal friction forces when riding. 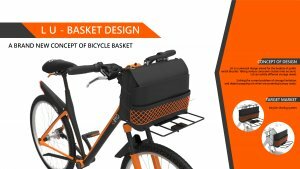 Description LU is a universal design for the baskets of public rental bicycles. Taking various consumer niches into account, LU can satisfy different storage needs. With an L-shaped iron frame wrapped by a movable water-resistant canvas, the users can arbitrarily adjust the size of the storage. The elastic strings on the sides can tighten and secure the objects in the basket, ensuring the objects from falling out. Description In order to solve the problem that existing tire tools are inconvenient to carry and affects the appearance of the designs, the bicycle tire tools are optimized. 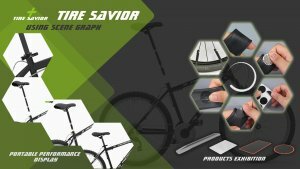 All the tools needed are integrated in the space of a cylinder, which can be hidden in the seat tube, which is both portable and does not affect the appearance of the bicycle, and can be used at any time.